How Do Verju Laser Treatments Help Reduce Cellulite? Sometimes losing weight is difficult. Or even worse, you look in the mirror one day and see unsightly cellulite. There really are only two choices; accept it or do something about it. If you choose the latter, you are not alone. Studies have shown that nearly 90% of women have cellulite of the legs, buttocks, or abdomen! Cellulite is subcutaneous fat causing dimpling of the skin. Its appearance is uneven, bumpy skin. Some people say it looks like an orange peel or cottage cheese. Cellulite generally affects the thighs, buttocks and lower abdomen. Unfortunately, cellulite cannot completely go away by changing your diet or exercise routine. Stubborn fat is another common complaint among women of all ages. As we age, our bodies make it harder to break down fat. Pregnancy, illness, hormones, and certain medications can also affect how our bodies store fat. Diet changes and exercise can vastly improve our health and reduce overall fat. However, sometimes our bodies just won’t let it go. How to Get Rid of Cellulite and Body Fat? Since diet and exercise have minimal impact on reducing cellulite, and sometimes our bodies have a difficult time losing fat, the next course of action would be treating it medically. What Do I Need To Know About Verju Treatments? Science has vastly improved over the years. Everyday, new technology appears to combat some issue we have with our bodies. Technology like the Verju Laser by Erchonia helps fight some of these body issues. 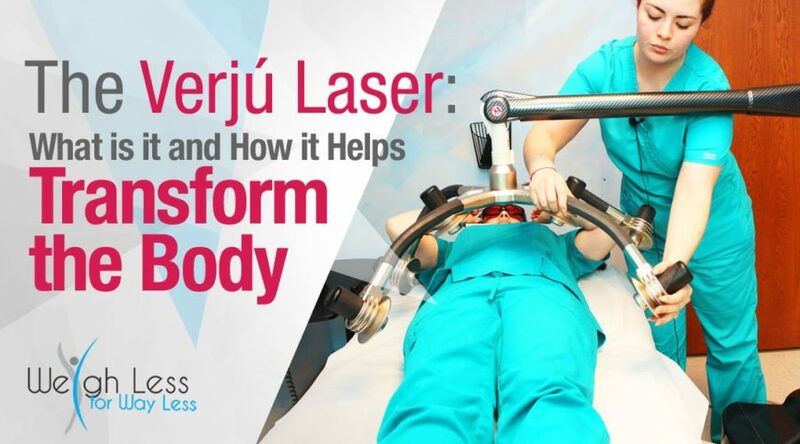 In a single 60-minute session, the Verju Laser uses six low-frequency laser beams that sweep across the area of concern. The treated area is then massaged with the Erchonia percussion device for two minutes. When the laser sweeps across the problem area, it is targeting fatty lipids within fat cells. 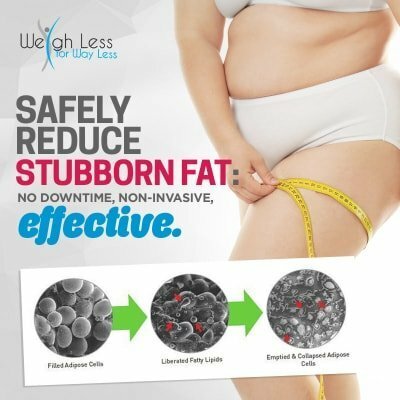 This, in turn, causes the fat cells to collapse and shrink in size, which reduces the circumference and the appearance of cellulite. These fatty lipids then enter the lymphatic system where they break down into free fatty acids. These free fatty acids are converted into energy in the cardiovascular system. Because the laser penetrates the skin to treat hypertrophic adipocytes, it also increases dermal collagen of the skin. The Verju laser system is the only, FDA approved green laser. It is a safe and effective option for non-invasive treatment in fat loss and the appearance ofcellulite. Because of the laser’s low-level frequency, there is no possibility of injury. Unlike liposuction or other hands-on treatment, no devices push up against your skin. You will lay underneath the Verju lights and the machine will continue to complete the rest of the treatment. The number of appointments will vary based on the degree of cellulite or fat loss you wish to achieve and by your body type. The recommendation is to schedule at least six appointments to effectively treat the problem area. It is highly recommended that you do not miss an appointment. Prior to starting the Verju treatment, it is very important that you commit to the recommended treatment schedule. If you exceed more than 72 hours between sessions, fat may uptake by the original fat cells. On the other hand, if you schedule your appointments too far apart, fat may begin to rebuild in the treated area since it has not been thoroughly treated. How do I get Started with Verju Laser Treatments? If you live in the Chicagoland area and want to learn more about Verju or are ready to make changes, contact our office at (630) 2532-5821 and schedule a free consultation. We treat patients with Verju in our Elmhurst and Oak Lawn, Illinois offices. Our physicians will discuss your concerns, provide an evaluation to ensure you are healthy enough for this treatment, and begin planning your treatment schedule. If you have any questions or concerns, wish to schedule an appointment, or want to learn more, visit on the web.